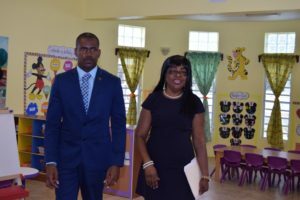 Basseterre, St. Kitts, March 07, 2017 (SKNIS): The Ministry of Education has provided a high standard of quality as it relates to the Victoria Road Pre School learning environment. It is against this backdrop that Mrs. June Wallace, Director (Ag.) of Early Childhood Development Unit (ECDU), urged teachers to be fully responsible, as the children’s development is in their hands. Speaking at the opening of the Victoria Road Pre School on Tuesday, March 07, Mrs. Wallace outlined a number of responsibilities of the staff, noting that it is now on staff members “to provide developmentally appropriate opportunities, which cater to the rich Kittitian and Nevisian child”. The acting director said that with the new institution the ECDU environment is most fitting for learning. She explained that studies revealed that providing supportive conditions for early childhood development is more cost effective than attempting to address consequences of early stress and adversity later on in life. Mrs. Wallace mentioned the evolution of early childhood in St. Kitts and Nevis, noting that the United Nations International Children’s Emergency Fund (UNICEF) played an integral role in ensuring that early childhood staffers were exposed to international standards of training. She commended the strong leadership of Leonie James and Vanta Walters over the years and encouraged the staff to continue to maintain the good practices that have been instilled in the institution. These stalwarts, she said, embedded initial training provided in UNICEF’s High Scope Curriculum. She added that presently, since the government’s initial investment in the 1980’s, it has maintained a system for salaries, training and development, licensing, standards, monitoring, and the provision of equipment and materials for centers.